I have several ideas for rotary tool accessories that would make my life easier, but they would have to be attached at the neck. So I need to cut out a hole, and tap it out to the right thread size. Anyone know what that is? Doesn't have to restate their needs. Pretty sure it was in the title, wasn't it? It was, wasn't it? Idk what the answer is but damnnn! you could take the stock collar ring into the hardware store and try out various Bolts to see which fits. once you find that, you could buy one and use it to cut threads in your material (cut a slot down the side across the threads with a file, then slowly thread it in, back it out, advance, back out, until your threads are cut). You can find YouTube videos on thread cutting, but as far as your thread size i think that's your best bet - just take it right to the hardware section and see what works. I know this is old but he sure seemed to have a difficult time getting an answer to a simple question. Spindle nose on Dremel is either 3/x12 or 3/4 x 16 with the 3/4x 12 being the most common. I had a rotary tool made by Dewalt/Balck and Decker and it was also 3/4x12. well, ive found m12 to be just too big, and m10 just too small, so M11, however m11 is a bit strange, so ide asume its whatever stupid imperial equivalent falls within that range. I need to make a mandrel to hold a chuck I bought for Dremel did anyone ver find a supplier of taps and dies this size? If I knew how I would. Oops. Sorry, I missed your proprietary. My reply to that is, technically it's not proprietary ( legally it can't be proprietary ), practically it's not proprietary either ( like you said just buy one and measure it ). Not only is it not proprioetary, it's almost standard. I understand Dreml monkies around with the sizes of their high end models to put off competition, but I think that may not make much sense any more. If I bought a Dremel and either made a lot of tools for it, or bought a lot and then discovered they wouldn't work in the new Dremel I had bought to replace my old Dremel, I wouldn't get the new Dremel I'd get some brand that is tends to stay the same. There is a simple teat though to see if it is proprietary. Most tools that screw on are advertised as "fitting most rotary tools". The only exceptions are a few newer tools like Dremels, planar attachment and their jigsaw, which are limited to the XPR series. I don't think that's because they don't fit the collar of other tools, other tools don't have the needed power. Hi I am also in the same boat trying to make accessories for my Dremel tool the collar has a thread TYPE UNS, (3/4" X 12 unified national special). But I am having problems to find a place to get a tap of that size if anyone has an idea where these taps and dies can be obtained it would be great. I know this is a very old post but maybe someone can help. Thanks. McMaster-Carr Industrial Suppy is a good choice, if pricey. Are you sure your Dremel collar is really 3/4" diameter? That's as big as your index finger. Ok everybody I know why the OP is complaining as I have asked what the thread is on my rotary tool (Dremel XPR400) before as well. You realize he did not ask for input on his attachments he simply asked for the thread type of a rotary tool so why not just answer what was asked and leave it be. My Dremel 400XPR is a propitiatory thread measures 0.275" so its either a 9/32" x 40TPI or 1/4" x 40TPI I measured thread pitch via a gauge and used a caliper for the major diameter. And im responding to this old thread as when you google dremel collet thread size this is one of the first links. I know this is late but others may be after the same info. For starters, be nice to Kiteman. The rest of us like him. Second, here's how to measure the threads yourself. Assuming you have a decent tap and die set, it should come with a thread gauge, which looks like this. (That image comes from this website, which also explains the process) Try different gauges until one fits perfectly into the threads, and read the TPI off the side. Finally, our Black & Decker Wizard, which is a cordless rotary tool that is compatible with the Dremel, has a collar with 13 TPI. 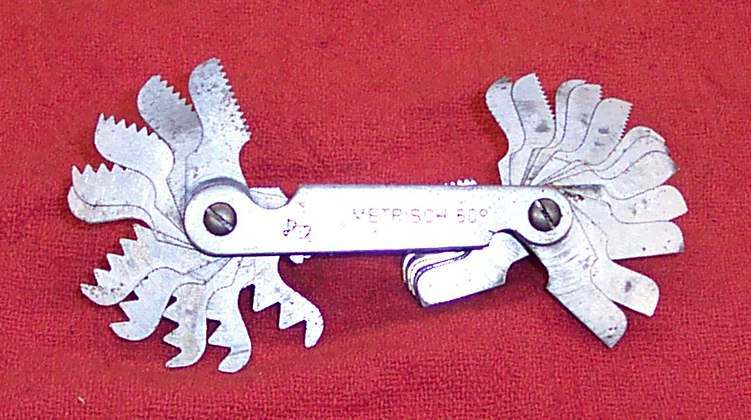 It screws into the same vise attachment that our Dremel does. Awww.... Thanks for that, C.
Dude, which part is the neck? Is that where the collet screws on? Is that where the shaft connects to the tool? Or is it part of the handle of the dremel that doesn't move? Do some research, go down to the hardware store and see which nuts fit. Due you some kind of troll or something? Why drill the tool out? If you were truly making life easier, you'd design widgets that fit into existing collets. Doh! You have to drill and tap the material that attaches to the tool. Don't see how you do that by putting the material in the collet. Seems totally counter productive too me. Maybe you ought to tell us what you're actually trying to make - all my rotary tool accessories have smooth shafts that go into the collet, then I tighten the collet to hold the accessories in place. made easier if I tried to make it go into the collet. Can't see how that would do anything but complicate everything. to make a hole in some material , probably plywood, maybe a sheet of some kind of plastic/resin, or a sheet of metal ( probably not, metal is expensive and so are the taps for it ) that I can screw my rotary tool onto. You don't even know that. All you really need to know is that I need to know the thread size of a generic rotary tool collar. You also say that you don't have anything that doesn't thread on the collar. That everything you have goes into the collet. You strongly insinuate that they don't exist. So I will list a whole bunch of jigs that do so. Start with GyrosGuard Safety Sheilds made by Gyros. Next look at Milescraft and their tools numbered: 1000,1001,1097,1098. Proxxon tools, MB 140/S, OFV, FT 300, FEX, may not attach to threads, because it's not clear to me that Proxxon's rotary tools have threads. If they do then these tools use them. Of course we have Dremel itself, with it's tools 565,568,670. Yes these tools come with bits ( most of the time ), but the tools themselves do not go in the collect but attach at the neck. other companies tools could not be used in them. They each have a reputation of not being steady, so I suspect having the tool attach via threads would have been a better engineering decision. So it does indeed make sense to want to be able to make tools that attach to the necks of rotatry tools. I suggest that next time instead of being so negative about what can be done with (to? ) rotary tools, you go out and actually learn what can be done. Are you finished ranting? If you are, maybe you ought to learn to read what is posted, rather than adding buckets full of your own meanings. You said you have ideas for accessories that would "make life easier". As far as I can see, though, having to unscrew the neck of the tool every time I want to change accessories makes life less easy. That is the whole point of using a collet instead of a normal chuck - it makes life easier. That's why I asked for clarification regarding your plans - nobody can help you properly if you don't tell us what you want to do. How is asking for clarification of your needs "being so negative"? So, you said you had ideas, I asked for clarification and you spit out your dummy with an "I don't know!" If you don't know what you want to do, how can we help you do it? It's not until three quarters through of the way through your little temper tantrum that you actually bother to (indirectly) clarify the point that you mean "things you can clamp to the tool" instead of "things I can power with the tool". So, have you decided what help you want? Or do you just need somebody to help you put all your teddies back in your pram? OK, I was just going to flag this response, but I'll comment first. Kiteman offers you a helpful suggestion, not at all off topic. And at least partly to open the dialog and elicit more information. Your intent isn't obvious as you state: Can't see how that would do anything but complicate everything. (?) Of course we can't, as we don't know your intention.